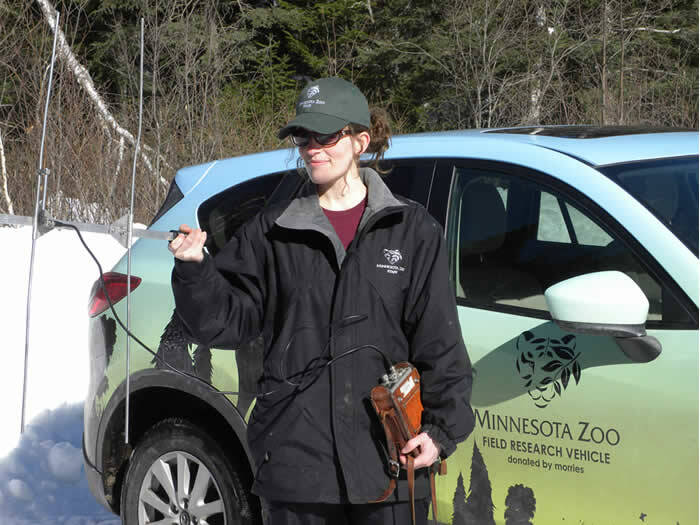 Dr. Kim VanderWaal is a postdoctoral research scientist in the Minnesota Zoo’s Conservation Department. She is studying the risks Minnesota moose face from parasites transmitted from white-tailed deer. Researching wildlife is not always glamorous. Indeed, I have found that some of the most valuable information about wild animals can be learned by studying what they leave behind: their droppings. On any given day, one can find me strapping on snowshoes and heading into the northwoods of Minnesota in search of deer feces, or “pellets.” I follow deer tracks deep into the woods until I find droppings, which can tell me a great deal about the animal that left them. Specifically, examining deer pellets can tell me whether or not the deer was infected by parasites. These parasites are not debilitating to the deer themselves, but pose a significant health risk to moose. Minnesota moose populations have declined precipitously over the past decade, and Minnesota Zoo scientists are heavily involved in investigating possible causes of the decline. 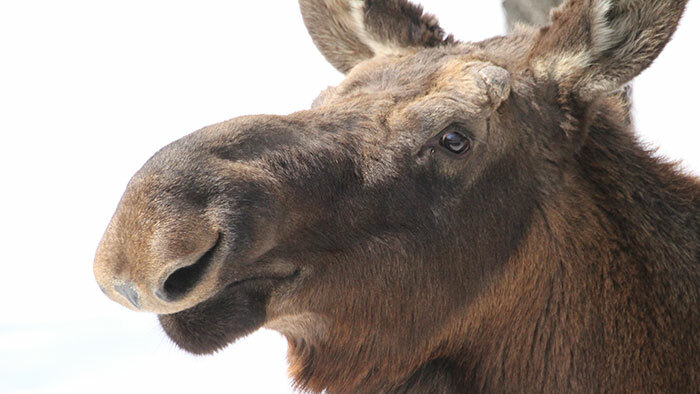 Past research shows that up to 40% of adult moose deaths are health-related. White-tailed deer are the primary host for brainworm and liver fluke, and both of these parasites can cause illness or even death in moose. As a disease ecologist, I am interested in the role of animal behavior and the environment in shaping patterns of parasite transmission in deer and moose. 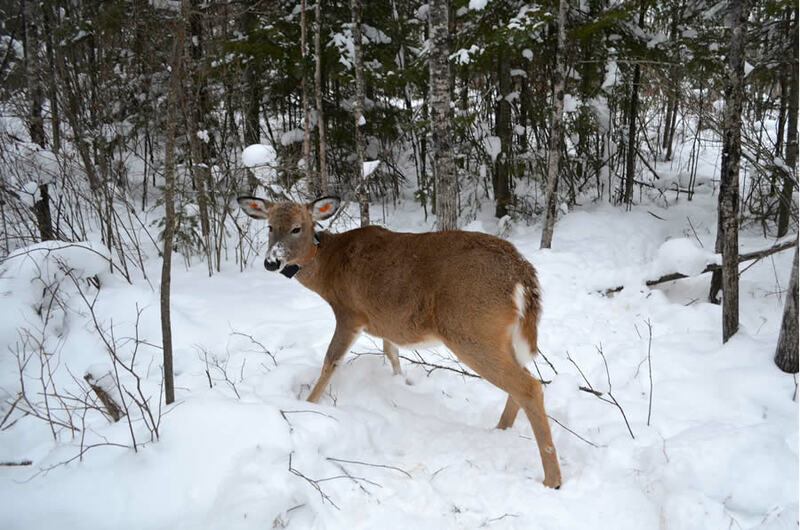 In partnership with Dr. Ron Moen of the University of Minnesota, Duluth, our research seeks to understand where and when parasite transmission occurs between deer and moose in northeastern Minnesota. One of the main goals of our research is to learn how ecological factors (such as temperature and precipitation) promote the transmission of brainworm and liver flukes, and use this knowledge to develop a “risk map” showing where the environment is favorable for high levels of parasite transmission from deer to moose. To map parasite transmission patterns, we are collecting deer pellets from across northeastern Minnesota to identify the types of environments that lead to high levels of infection in deer and moose. We are seeking assistance from the public in collecting deer pellets. Gathering data to map parasite risk across moose range is a large undertaking, and the project would be greatly enhanced with the help of concerned citizens traveling or residing in northeastern Minnesota who want to aid in efforts to understand why moose are declining. If you or someone you know in northeastern Minnesota is interested in helping us collect samples, please let me know! You can contact me at [email protected].